If my life is a song, I have much to learn about it from music. The previous post in this series (Life Metaphors: Music, Part 1) explored the power of music to resurrect the past and make it coinhere with the present, using Robert Siegel’s Whalesong as a point of departure. In this post I want to reflect on the same theme, from the viewpoint of Christian theology. That we can learn much about life from reflecting upon music is explored by Jeremy Begbie, Theology, Music and Time (Cambridge University Press, 2000). Reading Begbie alongside Whalesong is an ideal way to keep the imagination and intellect in tune, avoiding the imagination deficit disorder. The one reinforces and deepens the other. In this and the next couple of posts, I’ll mention three ways that music teaches me something about my experience of life: to live in time, to live in hope, and to live in inexhaustible grace. 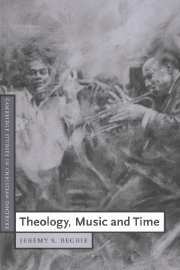 Although I touch upon these themes in a personal way, Begbie explores the theological implications of music with profound insight as a professionally-trained musician and theologian. I am neither, but these reflections profoundly affect my view of life. I would never detract from the kernel of wisdom behind Emerson’s words that one must repudiate the tyranny of the past and the future, consciously attend to the present, and experience each moment as fully as possible. Before we know it, we will turn around and want these moments back . Living in the present means that I savor each moment, and then willingly let it go, embracing change by welcoming the next moment as it comes. In contrast, to hold on to the past, to refuse to let it go, would be to deny the reality of the present. Similarly, to live in the future, refusing to experience the present, would cause me to miss out on the reality of a present hope. In that hope we have confidence that both past and future are being redeemed. So I learned a profound truth from the existentialist affirmation that we live now. Thus to release the past and welcome the future willingly, without hanging on, is to participate in the rhythm and music of life, to accept our nature as finite creatures moving within a greater temporal reality. Yet Emerson’s manifesto asserts more than this, as if the energy of life were exclusively concentrated in the now. Contrary to Emerson’s actual words, the now as we experience it in music does not exclude the past and the future, but rather gathers them up in a relationship of “coinherence” (more on this below). If taken literally, Emerson’s statement entails a disintegration of temporal reality, a splitting apart of the past, present and future. This split diminishes the reality of the present by subtracting the coinherence of the past and future. In a supreme paradox of existentialism, the futility of these despairing words is decisively contradicted by the very musicality of the song. This work is a masterpiece of despair precisely because of that contradiction. It is a hope against hope, as the piercing longing for coinherence awakened by the music compels one to protest that “dust in the wind” cannot be the last word. Indeed, like Emerson’s manifesto, “Dust in the Wind” is a powerful example of an insidiously deficient sense of temporal reality. We are led astray if we have learned from mathematics that the present is a moving point on a timeline, or from physics that a single moment is a solitary tone from an oscilloscope. If we visualize our lives as a timeline where the past and future are separated by the present, we tend to think of the present merely as a geometrical point. If reality is equated with the present, infinitesimally small, the now so conceived rapidly approaches a vanishing point. This reduction of reality and the concomitant disintegration of personal identity is one part of the narcissism of our culture, described with arresting clarity by Christopher Lasch . The physicist’s simple oscilloscope, like the mathematician’s timeline, similarly misleads us. A single tone from an oscilloscope discloses nothing to the physicist of the dynamic way we experience the full temporality of music. We no more experience life as a moment in abstraction than a song as a single note, devoid of rhythm, harmony, tempo, texture and mode. Our experience of music shows us that the past and the future are not insubstantial. Now we see that history is real. A view of the present cut off from the past and future is radically deficient. Time is not a mirage or illusion. Music shows us how to embrace a full temporality, a now that is not cut off from the past, and in which the future already has begun. The reality of coinherence in our experience of life is thus disclosed to us by our experience of music. Hruna might need all night and day to sing his whalesong, yet throughout the song, his past acts as a real presence in a dynamic movement toward an already-becoming future. No wonder, as noted in the last post, that the music of past moments in our lives still has the potency to awaken us to a personal identity which is far from being confined exclusively to the present, but rather in which the past coinheres in a full temporal reality. This entry was posted in Art-Music-Lit, Theology. Bookmark the permalink. I didn’t realize we shared a common love for the music of Kansas. Have you ever read Livgren’s “Seeds of Change?” It chronicles the formation of Kansas as well as Livgren’s spiritual journey culminating in his embracing of Christ. A wonderful story! Greg – We should get together to listen to and reminisce about Kansas! Yes, I’ve read Seeds of Change – a great book. I hope Livgren will write a sequel someday to bring us up to date. Age intensifies my longing to hear the song God has created through his sovereign will and work in this Creation. Michael, thanks very much for reading and leaving a comment. I would much prefer a face to face conversation over chili and cheese fries at Steak and Shake. I miss that a lot! And I grieve at the deterioration afflicting you because of the eye condition. I cannot bear the thought of a world gone black and white because of the loss of your painting palette. Thank you for your confession that through music we long to hear, and perhaps catch a glimpse of, the divine song behind the mystery of creation. I couldn’t agree more, nor affirm more strongly the meaningfulness of hearing the words above coming from you.